– I cut 1cm wide x 2 inch long strips from an old plastic reward card. – Pushed 2 strips into 2 slots in the player, pushed and pushed but the player refused to pop out. – I give up. I’m putting aside this need to do something about the radio player till next year. I’ve decided that silent driving may be a good thing for me. I’m constantly bombarded by media: the tv while I cook and eat, the iPod while I run, the macbook while I work. Some silence is good for my soul, my spirit and my ears. October 2006, I volunteered for World Vision and got to see Third Day and David Crowder Band for free. Today, I received an email from World Vision asking for volunteers for Casting Crowns with Leeland‘s concert at Lehigh on November 9. I get to see them for free…yay! Once upon a time, I faithfully followed the 13-week walk/run program but somehow I slacked off when I reached week 9’s running schedule. Maybe it’s the longer running schedule, maybe it’s the weather, maybe I just got tired of it, or maybe I saw week 10’s schedule (run 30 min: walk 1 min, repeat once) and got scared 🙂 Well, I started week 9 again this week and I’m determined to complete the 13 week program this time. There’s a lot of this langsat- or mini manggo-like fruits in some spots around the trail. I call them ankle busters….got to be very careful when running through this maze of ankle busters. I stumbled over them once or twice (almost twisted my ankle) and I’ve seen it happened to other runners too. I seldom buy books from local bookstores, preferring to buy cheaper new or used books from online stores. Actually, I rarely buy books, I prefer to borrow from the library or do an inter-library loan. But last Saturday, I decided to go to the local christian bookstore to get a copy of The Apologetics Study Bible. I checked online and it cost $26.40 from Amazon.com. I was about to get it from Amazon but the free super saver shipping takes around 2 weeks. 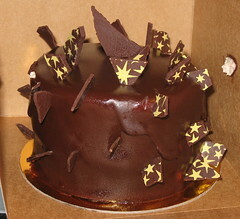 I realize how Americanized I’ve become when I cannot wait 2 weeks to get something…I want it now, I want it in an instant! The same book cost $39.90 at the bookstore and with their 60th anniversary sale (20% discount) and a 6% sales tax, I paid $33.90 for the book. I contributed $7.50 to the local christian bookstore economy! I can see how difficult it must be for them to compete with Amazon, Walmart etc, but I definitely won’t do this often, I prefer to contribute to my pocket economy. 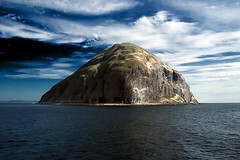 Ailsa Craig… a rocky islet in the Scottish Firth of Clyde. 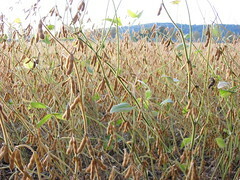 The soybeans have turned yellow. 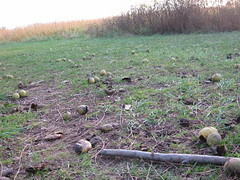 Pretty soon all of it will be harvested leaving a barren land for another long cold winter. How depressing…. Starting line: This is so exciting! 1km: Cannot walk now, everyone’s still running. 1mile: I’m already a little pooped now. I don’t know how I can sustain this. I so want to stop running and walk now but everyone’s still running. Half way point: Why did I sign up for this??!! I should have signed up for the competitive walk instead. I can’t believe I still have 2.5km to go. I don’t know if I can keep on running. I am so out of breath. OK, I don’t care if everyone’s still running, I have to stop running and walk a little bit now. Oh no…so many people are passing me now. 2mile (water break): 1 more mile to go. Cannot look behind, must move on. 25:11, OK, I think I can run under 40minutes if I keep this up. I’m so tired. I’m so out of breath. I’m running so slow. Oh no, I see a hill. Small hill: No way I can run up this hill. I’m going to walk up this hill. Another hill: What another hill! I’m going to walk up and then run down the hill. 400m to go: OK, just keep on running now, don’t walk. 200m to go: Keep on running, don’t walk. Saw the clock: Whoa! I can get under 39 mins. Better run as fast as I can now. Finish line: Water! I need water! Where’s the water?! 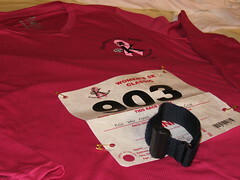 I went to the Race Expo today to get the race shirt, bib and the ankle timing band. I’ve never had to wear an ankle band before, so I guess this race is slightly bigger deal than my previous races. The ankle band has a chip in it that gets scanned when I pass the finish line for my official race time. And no, I don’t get to keep it after the race. If lost, I’ll have to pay a $25 lost-replacement fee. There’s a place on the bib for race dedications. Instead of leaving it blank, I thought I might as well dedicate the race to someone, so I dedicate this race to my aunt (3-2-ma) and my mom. Some races are for kicks, some are for glory, this race is for LIFE!